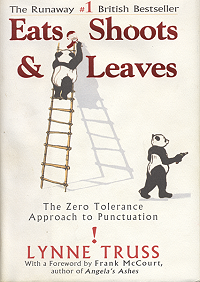 I recently read the amusing book Eats, Shoots and Leaves, written by Lynne Truss. One of the very interesting things about writing publicly is, everyone feels free to offer helpful advice. Unfortunately, much of the advice results in conflicting information. I'm of a personality type that sees the world in shades of gray (or in my case as a Canadian, grey). I've had a few discussions with my husband, about my run on sentences, it turns out according to Lynne, that my real problem is not my sentence structure, but my lack of fame! Oh dear, I think I just did it again! Truss comments: "so many highly respected writers observe the splice comma that a rather unfair rule emerges on this one: only do it if you're famous." As I punctuate this post, I find myself second guessing each decision. Do I use British or American form? Which of the many Style guides should I use? What does the Grammar Girl say on the topic? Meanwhile, I know there are readers out there, shaking their heads and mumbling "It's just NOT done that way" at every choice I make. Hah! I just started re-reading this book after it turned up as I unpacked after my recent move! I am also guilty of the splice comma, just didn't know it was called that, but that's how my brain works, or rather the thought processes in my brain, but I guess you already knew that, didn't you .... and no, I'm not famous, but really who cares. Also, being from Australia, I too spell it grey, and also wonder if I should use American spelling, as most of my blog readers are from the US, or maybe they're not, I really don't know. So, is it fiber or fibre? My pro-knitters group has talked about this as well. We are Canadians, so Americans often assume we are making errors with our spelling and punctuation. I sell more patterns in the U.S. than I do in Canada. At this point I use the Canadian form, some of our members feel you should use the choice of your largest customer base. Others feel there is some cachet in being proudly Canadian. In practice,the result will be someone is going to think you are wrong no matter which way you go.